My dear friend Misty had a problem. Her darling daughter refused to sit in a high chair because she so desperately wanted to be like her older brother. This resulted in Misty standing next to her throughout all her meals so she wouldn't fall off her chair. She needed a solution. Her Mom told her how her Great Grandma used to tie her to chairs when she was little with dish towels. This sparked an idea in Misty's head and Tie Chair was born. Tie Chair is a harness that fits onto any dinning chair. 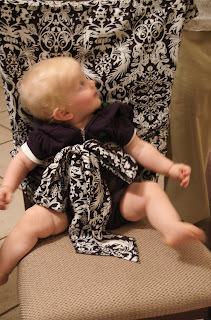 It easily folds up to fit in your diaper bag making it convenient to take to church activities, grandma's house & restaurants (seriously those high chairs are always so disgusting!). I have used it with my little gal and I must say I love it! It's easy to use and practical. It's great for Grandparents who don't want to buy a highchair & it takes up less room than a booster seat. Just fold it up and store in the linen closet. Or for the traveler. No need to worry about packing the booster seat. Just throw it in the diaper bag. Visit her website at www.tiechair.com for more info and better pictures (mine aren't very good!). I don't know about you but I love hearing about the latest and greatest baby gadgets! That is hilarious! And you can get those pre-made even. Brock would just untie it. It is designed to tie in the back also. They thought of everything!